READY PLAYER ONE was the best adaptation we'll ever get of the novel. Hi folks. I'm sure by now you've seen READY PLAYER ONE, or have resolved not to see it. This is my take on it, which, tl;dr, is that this film is not the book and that while that’s a shame, it’s still the best you can ever really hope for. There will be spoilers for the film and the book, here. If you haven't read the book, I urge you to look for a used copy somewhere, especially if you were born before 1980. You owe it to yourself to read it once without someone else's opinions in the way. It's a great book. And, let me be clear, I think READY PLAYER ONE is a fun movie. "Fun" is a codeword these days reviewers used for 'a dumbed-down-for-the-audience rollercoaster", and that's true of my recent PACIFIC RIM: UPRISING review, too. The novel has been truncated, dumbed-down in parts, and made something less than the book for an audience that expects a different kind of experience. It's a good journey... and I love seeing it on a big screen... but it could never match the beauty of what was in my head when I read it. But it tries, and I can appreciate it for what it is without condemning it for what it couldn't be. 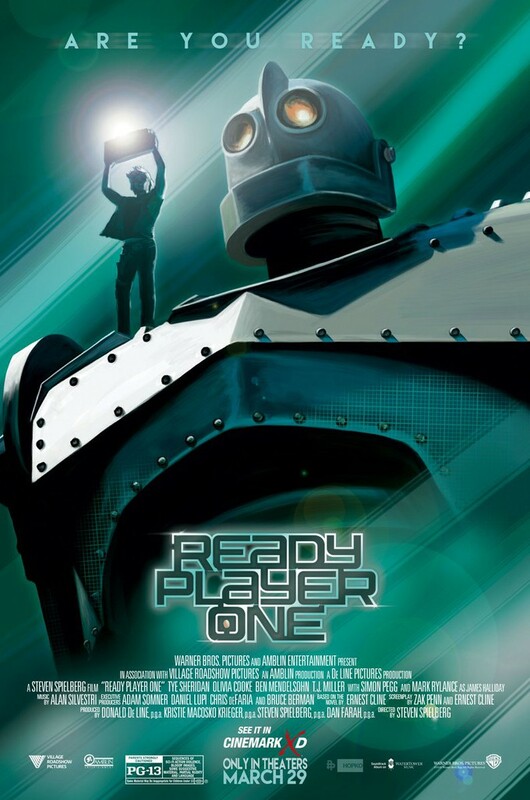 When Ernie Cline was writing the book "Ready Player One", memetic theory was in its infancy. Even by the book's publication in 2011, memes were still a bit of an evolving phenomenon, not yet a standard of daily life, and Intertextuality was still something for college-level academics. I am on record as being a fan of the book. Cline's take on an Easter-egg hunt inside a worldwide dominating MMO was filled with brilliant, dazzling things the children of the nineteen-eighties would love and want to share. His bombardment of thousands of pop-culture references is like a novel in itself, a memetic tale about someone looking for a family in a non-reality, and finding one in the real world, eventually. And wrapped around all that nostalgia was a pretty good novel, about a kid who was more into the virtual reality he played in then the real world he actually lived in. As a lifelong WILLY WONKA AND THE CHOCOLATE FACTORY fan, and as someone old enough to remember what it was like when the first of the Swordquest games came out for the Atari 2600, I was the perfect demographic for Cline. I knew it wasn't a perfect novel, but it was good, and as a City of Heroes devotee who was crushed when that MMO closed down, I'd seen myself in Wade and in his journey. And I liked Wade, Sam, Aech, Shoto (and Daito)…. when I heard that Steven Spielberg was bringing them to the big screen, I was looking forward to it. Despite Ernie Cline being involved in the writing of the script (with Zak Penn handling the lion's share), a great deal of the novel had to be altered for the change of venue. It's the most obvious thing in the world to tell you that it sufferers for the translation, but there are actually a few improvements in making it a film. For the most part, they are cramming a story that takes place over a few years into a few days. There’s a major death — a very violent, horrible death they’ve cut for the ratings — and it changed a lot of the plot. The romance is easier to sell in a novel than in a film where actors stand side-by-side. In the novel, Wade/Parzival falls hopelessly in love with Art3mis and then, by opening up too soon, loses her. When she finally meets up with him again, Wade has put himself in jeopardy to rescue all of his biggest competitors. Film Wade never takes this kind of risk, but he doesn't have to-- he is decreed the Chosen One by Art3mis. Gone is the book's assertion that the High Five are NOT a clan. Not only that, but Sam is a revolutionary in the real world, and she literally welcomes him to it after the Stacks bombing. And all of the High Five survive to the end. The movie keeps the death of Wade's sour aunt and her boyfriend — actually plays it up for dramatic tension — but then changes who winds up an indentured servant in the IOI tech service. This, for me, was the change that hurt the most. One of the things I loved about the Novel High Five, was that they were rivals to the very end. No clan. No promises. Parzival wasn't l33t when the whole thing began, and Art3mis definitely was — she was a celebrity gunter with a channel who did walkthroughs, whereas he was just a level one noob with basic gear (and no Delorean). Art3mis beat Parzival to finding the first challenge, but Parzival happened to be better at playing one of Halliday's favorite arcade games, Joust. Try as she might to master the game, Parzival does it on the first go ‘round. But Art3mis beats him to the second challenge, as well, and leaves him in the dust in pursuit of the Egg. The changes made in the film adaptation are hegemonic tropes: the Chosen One who alone can defend the universe from an evil. Book Wade is always using his brain (and his love of Halliday's world) to solve his problems. Film Wade is like that, but he is elevated (Sam pushes him through a door and lets herself be captured, telling him he must be free to save the world), and the much-more-ready-to-rock Sam becomes the Damsel in Distress that he must rescue. This will be a minor issue to some, but I liked how the novel dealt with what inspires Wade to storm the IOI castle in real life (one of the High Five dying in the real world). Instead of the death of a friend and a bit of ennui pushing Wade on, it's 'Save the Princess from the Castle'. The stakes are just as high in the novel. And Art3mis is still much better than the now-leveled and maxed Parzival. The question of l33tness is never really an issue for the two — they are both the best of the best, and you feel that title is earned based on the work they put into this quest. One curious thing is that the moment that Parzival proves himself against Sorrento in the novel, finally elevating his avatar to a level consistent with the rest of the High Five, has been given to Daito. This is good on the one hand because it gives us more of Daito and takes away from the Chosen One thing just a bit. On the other hand, it means that we see all of the High Five either sacrifice themselves for Wade or be eliminated by Wade themselves. I think, in the long run, it would have been better to give the moment to Shoto, but I appreciated them allowing Wade to shine a little less if it meant one of his chief rivals got a chance to shine. I love that dynamic of these rivals becoming friends, and these friends becoming partners. I was not a fan of the Quarter Bet. I would have preferred that it remained a relic Halliday left in the game for the right person to find. Og's influence is a bit 'deus ex machina' in both the book and the film — perhaps a little less overt in the film — but I still like that the Wade's saving grace, after Sorrento's ultimate kick-the-Monopoly-board move, was that he loved Halliday, and like Halliday, loved the challenge of playing Pac-Man until he mastered it. Plus, it’s a cool moment of Wade barking up the wrong tree, but gaining experience that helps him later on the journey. I feel that the changes to the key trials were necessary, even if I liked them less. Some people are gonna hate the car chase, and I will not be at all surprised if a Mattel version of that racetrack comes out in time for Christmas… but it’s a lot to ask of a movie audience to watch someone play a video game. Following a story as a protagonist plays a video game in the pages of a book is no problem, but having it happen more than three times in a movie (Joust, Pac Man, Black Tiger, Tempest) is a bit much to ask of an audience. I was very happy with what they did with THE SHINING; it would have been less interesting to try and reshoot THE SHINING from Danny Torrance's first-person POV. They would not have been able to do what the novel suggested with any of the three films the novel referenced (WAR GAMES, BLADE RUNNER, or MONTY PYTHON AND THE HOLY GRAIL) without tripling the budget, and the bits with Room 237 and the later hedge maze run feel like a video game you might be living in; even if they aren't particularly faithful to Kubrick's movie, they do feel like the way an 8-bit adaptation of THE SHINING might have played. I can't think of a single director who could have given us a better crack at READY PLAYER ONE than what Spielberg did. It is a licensing nightmare to pull off all of the references the novel did without breaking the bank. Joanna Robinson, in her Vanity Fair review, brought up the point that all of the licensing bent towards Warner Brothers, and nothing was licensed involving their big rival at Disney/Marvel/Star Wars (although the Millennium Falcon is quickly referenced by Sorrento as part of the bribe to join IOI). Such an undertaking is core to the anti-corporate, fair-play ideas of Cline's novel, but incredibly difficult to achieve legally without paying a lot of money for two-second glimpses. If WHO FRAMED ROGER RABBIT could put Daffy Duck and Donald Duck in the same scene, then surely we could see more of the Disney pantheon in this film…? In conclusion, READY PLAYER ONE is a Fun Film. I'm on board with this film, and I'll watch it again, but I will likely prefer the different heart in Cline's novel.